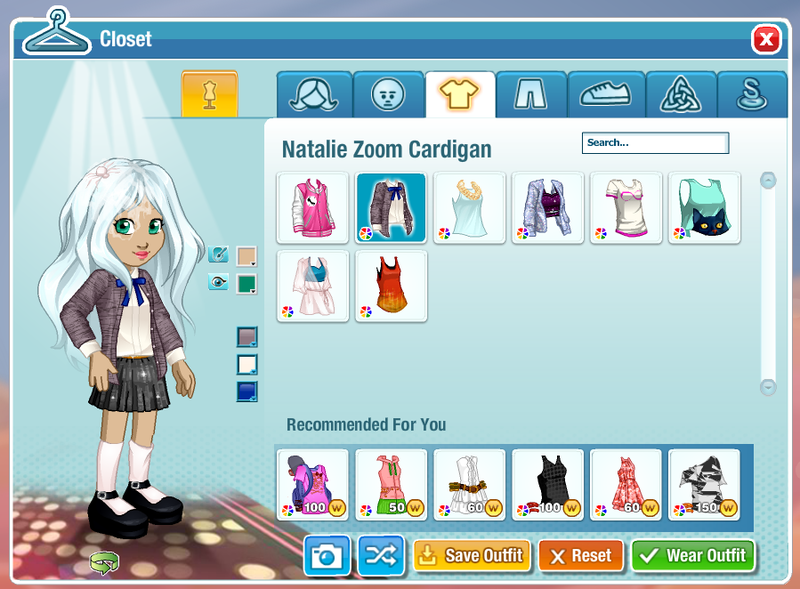 Woozworld Blog | Introducing your new Closet! Inside the Closet, each category of clothing has its own tab. You'll see all your hairstyles in the first tab, faces in the second, etc. You can now try the clothes before you wear them! Say goodbye to the painstaking process of trial and error. 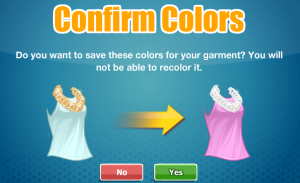 You can now try on all your garments in the Closet to see if they match: When you select a piece of clothing (for example, your hairstyle), it will appear as a preview on your Closet Woozen, but it won't yet show up on your Woozen in Woozworld. You can then switch to a different tab to select an item from a different category to build a whole new look. If you haven't yet set the colors for a garment you've selected, you can test out different colors on your Woozen until you find a combination that you like. Colors you try on in your Closet won't be permanently set until you choose to wear the garment, so feel free to change the colors of the different pieces of your outfit until you're happy with the result! Wear it! Click or tap the green "Wear Outfit" button to put on all the clothing you selected, letting everyone see your new ensemble. Save it! You can save your outfit to be able to easily switch back to it later without having to browse through your whole Closet or Inventory (see details below). Take a picture! Hit the camera button to refresh your profile picture with your new fresh style. If you colored a garment during this process, you'll be prompted to confirm the change before wearing, saving or taking a photo of your outfit. You will see the default colors of the item, and the colors that you chose. Remember that once you've confirmed the color change of an item, you will not be able to change it again. Save your favorite combinations so you can easily wear them without having to dig through your Closet or Inventory. 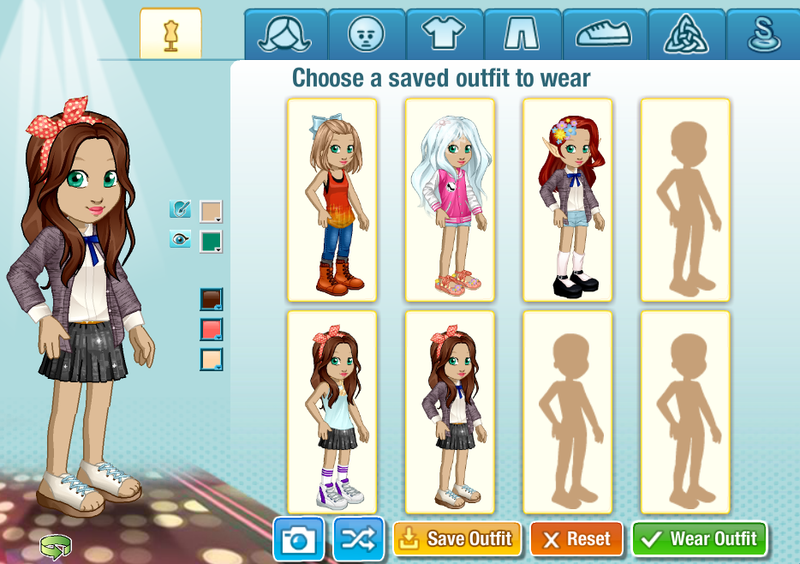 Select the desired outfit, then simply click or tap "Wear Outfit". Voilà! Tired of your old clothing? Looking for something new? At the bottom of the Closet you'll notice a list of recommended items, which are garments currently sold in Shopz that we think you might like. You can try them on in your Closet before purchasing to see if they complement your outfit. If you like a recommended item, simply click "Wear Outfit" (or "Save Outfit", or "Take a Picture"). Any of these actions will prompt a purchase of the garment and you can start wearing it without delay! I had many copies of the same piece of clothing and they disappeared! What happened? Don't worry! None of your clothes disappeared. To make it easier to find your garments, we grouped the different copies of the same item together in the Closet. Why do some items in my Closet have a red border? You can still try on these garments to plan for a future outfit! However, you won't be able to wear, save, or take a profile picture with them. Why can't I click/tap the "Wear Outfit" button? If the "Wear Outfit" button is disabled, it simply means that the items you selected in the Closet are exactly the same as the ones you're currently wearing, so there's nothing to change. What happens when I delete a Saved Outfit? Deleting a saved outfit frees up space to save a new one! Don't worry, clearing out a saved outfit won't delete any of the garments that were part of it. Why I can't wear some of my Saved Outfits? Selling, trading or deleting an item that was part of a saved outfit renders the outfit incomplete and therefore unwearable. If that happens, you can simply clear that saved outfit and create and save a new outfit in its place, using items that you own. Are there any other tips or tricks I should know? When looking in your Inventory, you don't see garments that you're currently wearing. In the Closet, it's a different situation: you'll see items that you're wearing alongside the rest of your clothing. However, you won't see any of your garments that are currently in Shop Podz in your Closet. Need some style inspiration? If you're using web Woozworld, there is a "Shuffle" button at the bottom of the Closet that will select random wearable items from your Closet. As MyaWooz always says, fashion is about taking risks! Have fun and stay stylish! Published on 2015-12-08 05:00 AM WT.